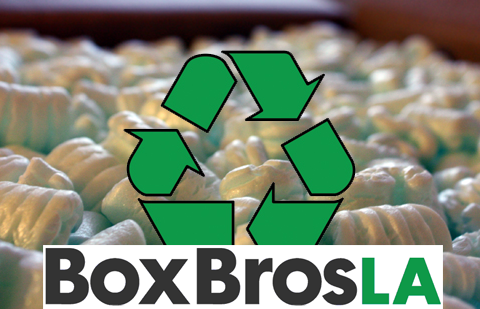 At BoxbrothersLA, we're committed to doing the best we can to preserve the environment. We use recycled cardboard,stryrofoam, bubble wrap and crating materials wherever possible. We offer recyclable packing peanuts made of cornstarch and are looking for new environmentally friendly packing materials. Our cardboard products are made from at least 80% post consumer goods and we hope to bring our styrofoam and poly products to that level in the near future or find alternative green packing materials. Most counties consider trashing styrofoam as illegal dumping. We can help. Just bring in your used packing peanuts and styrofoam materials one of our 3 locations ( Los Feliz, Atwater, Hollywood ) and we will dispose of them properly for FREE. By recycling harmful styro products we hope to reduce the amount of CFC’s released into the environment and maintain our green policy for decades to come. BoxbrosLA.com: Local Company Global Reach - Environmentally friendly packing and shipping .